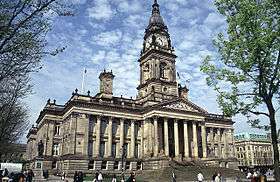 For the larger local government district, see Metropolitan Borough of Bolton. For other uses, see Bolton (disambiguation). 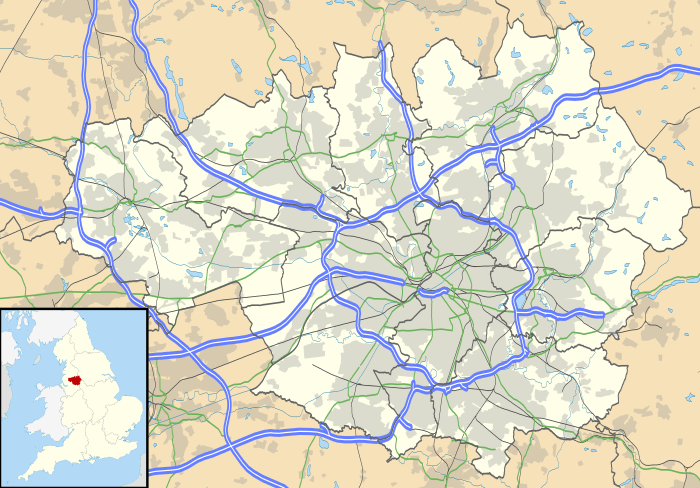 Bolton is a common Northern English name derived from the Old English bothl-tun, meaning a settlement with a dwelling. 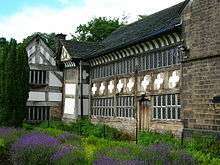 The first recorded use of the name, in the form Boelton, dates from 1185 to describe Bolton le Moors, though this may not be in relation to a dwelling. It was recorded as Bothelton in 1212, Botelton in 1257, Boulton in 1288, and Bolton after 1307. Later forms of Botheltun were Bodeltown, Botheltun-le-Moors, Bowelton, Boltune, Bolton-super-Moras, Bolton-in-ye-Moors, Bolton-le-Moors. 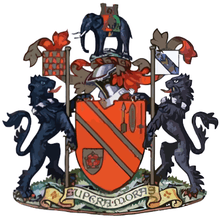 The town's motto of Supera Moras means "overcome difficulties" (or "delays"), and is a pun on the Bolton-super-Moras version of the name meaning literally, "Bolton on the moors". During the English Civil War, the people of Bolton were Puritans and supported the Parliamentarian cause. A parliamentary garrison in the town was attacked twice without success but on 28 May 1644 Prince Rupert's Royalist army with troops under the command of the Earl of Derby attacked again. The attack became known as the Bolton Massacre in which 1,500 died, 700 were taken prisoner and the town plundered. At the end of the Civil War Lord Derby was tried as a traitor at Chester and condemned to death. 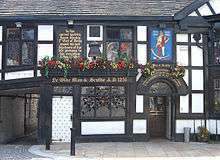 When his appeal for pardon to parliament was rejected he attempted to escape but was recaptured and executed for his part in the massacre outside Ye Olde Man & Scythe Inn at Bolton on 15 October 1651. A tradition of cottage spinning and weaving and improvements to spinning technology by local inventors, Richard Arkwright and Samuel Crompton, led to rapid growth of the textile industry in the 19th century. Crompton, whilst living at Hall i' th' Wood, invented the spinning mule in 1779. Streams draining the surrounding moorland into the River Croal provided the water necessary for bleach works that were a feature of this area. Bleaching using chlorine was introduced in the 1790s by the Ainsworths at Halliwell Bleachworks. Bolton and the surrounding villages had more than thirty bleachworks including the Lever Bank Bleach Works in the Irwell Valley. The mule revolutionised cotton spinning by combining the roller drafting of Arkwright's water frame with the carriage drafting and spindle tip twisting of James Hargreaves's spinning jenny, producing a high quality yarn. Self-acting mules were used in Bolton mills until the 1960s producing fine yarn. The earliest mills were situated by the streams and river as at Barrow Bridge, but steam power led to the construction of the large multi-storey mills and their chimneys that dominated Bolton's skyline, some of which survive today. Growth of the textile industry was assisted by the availability of coal in the area. By 1896 John Fletcher had coal mines at Ladyshore in Little Lever; The Earl of Bradford had a coal mine at Great Lever; the Darcy Lever Coal Company had mines at Darcy Lever and there were also coal mines at Tonge, Breightmet, Deane and Doffcocker. Some of these pits were close to the Manchester Bolton & Bury Canal providing the owners with markets in Bolton and Manchester. Coal mining declined in the 20th century. Important transport links contributed to the growth of the town and the textile industry; the Manchester Bolton & Bury Canal constructed in 1791, connected the town to Bury and Manchester providing transport for coal and other basic materials. The Bolton and Leigh Railway was the oldest in Lancashire, opening to goods traffic in 1828 and Great Moor Street station opened to passengers in 1831. The railway initially connected Bolton to the Leeds and Liverpool Canal in Leigh, an important link with the port of Liverpool for the import of raw cotton from America, but was extended in 1829 to link up with the Manchester to Liverpool Line. Local firms built locomotives for the railway, in 1830 "Union" was built by Rothwell, Hick and Co. and two locomotives, "Salamander" and "Veteran" were built by Crook and Dean. Bolton's first Mayor, Charles James Darbishire was sympathetic to Chartism and a supporter of the Anti-Corn Law League. In August 1839 Bolton was besieged by Chartist rioters and the Riot Act was read and special constables sworn in. The mayor accompanied soldiers called to rescue special constables at Little Bolton Town Hall, which was besieged by a mob, and the incident ended without bloodshed. By 1911 the textile industry in Bolton employed about 36,000 people. The last mill to be constructed was Sir John Holden's Mill in 1927. The cotton industry declined from the 1920s. A brief upturn after the Second World War was not sustained, and the industry had virtually vanished by the end of the 20th century. A network of local buses coordinated by Transport for Greater Manchester serves the Bolton district and beyond; bus operators include Arriva North West, First Greater Manchester, Diamond Bus North West and Maytree Travel. Bolton is also served by the National Express coach network. The bus station on Moor Lane is scheduled to be replaced by a new interchange in the town centre next to the railway station by the end of 2014, at a cost of £48 million. St George's Church was built between 1794 and 1796 when Little Bolton was a separate township. Built by Peter Rothwell and paid for by the Ainsworth family. in 1975 it was leased to Bolton Council, and became a craft centre in 1994. 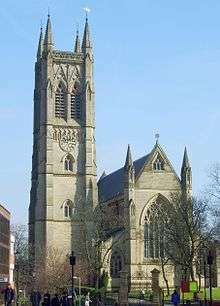 St Patrick's Roman Catholic Church on Great Moor Street,was built in 1861. Bolton Hockey Club fields women's men's and junior teams and has more than 120 playing members. The town has two local cricket leagues, the Bolton Cricket League, and the Bolton Cricket Association. Bolton also has a rugby union club, Bolton RUFC formed in 1872 situated on Avenue Street. The club operates four senior teams, as well as women's and junior sections. Bolton Robots of Doom is a baseball club started in 2003, playing home games at Stapleton Avenue. In addition to the adult team there is a junior team, Bolton Bears. Baseball in Bolton dates back to 1938 with a team called Bolton Scarlets. An American football team, the Bolton Bulldogs, plays home games at Smithills School operating varsity and junior varsity teams. Speedway racing, known as Dirt Track Racing, was staged at Raikes Park in the pioneering days of 1928, but the speedway was short-lived. Greyhound racing took place at the Raikes Park Greyhound Stadium from 1927 until 1996. Bolton has several theatres including the Octagon and independent groups such as Bolton Little Theatre and the Phoenix Theatre Company. Inside the Town Hall there is a theatre and conference complex, the Albert Halls. Le Mans Crescent, home to the central library, museum, art gallery, aquarium, magistrates' court and town hall, is to be the centre of a new Cultural Quarter. The library and museum are to be extended into the area now occupied by the Magistrates Court. Bolton Museum and Art Gallery houses a collection of local and international art, including work by the Bolton-born American artist Thomas Moran.Bolton Steam Museum houses a variety of preserved steam engines in part of the old Atlas Mill. Bolton is policed by the Bolton Central Division of Greater Manchester Police, which covers the town centre, Rumworth and Halliwell. Great Lever and Little Lever are covered by Farnworth Police Station, Astley Bridge Police Station covers Tonge and The Haulgh, Breightmet and Crompton while Heaton and Lostock, and Smithills are covered by Horwich Police (Middlebrook). The statutory emergency fire and rescue service is provided by the Greater Manchester Fire and Rescue Service, from Bolton Central, Bolton North, Horwich and Farnworth Fire Stations. Hospital services are provided by the Royal Bolton Hospital NHS Foundation Trust, which provides Accident and Emergency and other services at Royal Bolton Hospital in Farnworth. Community health services, including GPs, district and community nurses, dentists and pharmacists, are co-ordinated by the Bolton Primary Care Trust. Waste management is co-ordinated by the Greater Manchester Waste Disposal Authority. Bolton's Distribution Network Operator for electricity is Electricity North West Ltd. United Utilities manage Bolton's drinking and waste water. ↑ Chisholm, Hugh, ed. (1911). "Bolton". Encyclopædia Britannica (11th ed.). Cambridge University Press. ↑ Encyclopædia Britannica, 11th Edition - Bolton, including population figures for 1891 and 1901. URL accessed 26 November 2007. ↑ "Bolton MB/CB: Total Population". A Vision of Britain through Time. Retrieved 20 March 2016. ↑ William Farrer & J. Brownbill (editors) (1911). 'Townships: Great Bolton', A History of the County of Lancaster: Volume 5. Victoria County History. pp. 243–251. ↑ James Christopher Scholes (1892). History of Bolton: With Memorials of the Old Parish Church. Daily Chronicle. p. 393. ↑ Nicholas Carlisle (1818). A Concise Description of the Endowed Grammar Schools in England and Wales, Volume 1. Baldwin, Cradock and Joy. p. 639. ↑ A Short History of the School. boltonschool.org. ↑ Buildings of Bolton. Bolton and District Civic Trust. 1994. ↑ Barnes, Julia (1988). Daily Mirror Greyhound Fact File. Ringpress Books. pp. 276–278. ISBN 0-948955-15-5.